WE NEED YOU TO BECOME A VOLUNTEER! Volunteering as a firefighter is a good way to give back to your community, provide a needed service and help open doors for possible career opportunities. 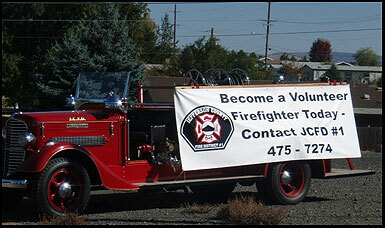 Jefferson County Fire District #1 relies heavily on a strong Volunteer force to provide fire, medical and rescue services to the patrons of Culver, Metolius, Madras and surrounding rural areas within the fire district. As a Volunteer there are many aspects of firefighting, emergency medical care, special rescue and fire prevention which you may have opportunities to be part of. Are at least 18 years old (16 years for Jr. Firefighters). Have a strong desire to help in your community. Have a valid Oregon Driver's License with a good driving record. Live within the Fire District boundaries. As a Volunteer Firefighter, you will be expected to attend drills once a week. You will also be trained to meet State of Oregon standards for Firefighters. The Fire District averages 50 emergency responses per month. O.K. WHAT DO I GET OUT OF IT?